Hi, I am interested in your 1970 Chevrolet Blazer (stock #136419) listed on Autotrader for $89,900. I'd like to get more information about this vehicle and confirm its availability. 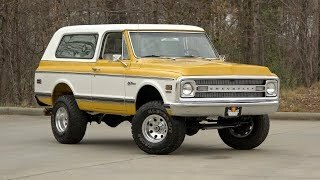 Body Off Restored K-5 Blazer 4x4 5.3L Vortec V8 Automatic A/C Bucket Seats /// This old school Blazer is a rust-free Oregon truck thats been subjected to a detailed, rotisserie restoration that, when all was said and done, approached $100K. Paint is delightfully retro, with bright Yellow caging clean White in Chevys traditional 2-tone scheme. And the trucks profile stays robust thanks to a removable hardtop. Toss the hood and youll find 5.3 liters of tough Vortec V8 that supplements proven factory internals with stainless headers, an aftermarket air tube and hot Precision Race Components heads. Behind that Chevy Orange mill, a smooth 4L60E 4-speed spins a requisite 12-bolt axle. That thoroughly modern powertrain pushes a decidedly factory chassis, with stacked leafs caging a Dana 44 front axle. Modern power steering makes parking easy and turns a cinch. Stops come courtesy of four retrofitted, power-assisted discs. And at the edges of the floor, 6-lug axles spin locking Warn hubs inside polished American Racing Bajas and 33x12.50R15 Kenda Klever M/Ts. Between the doors, a comfortable cockpit features awesome White Houndstooth upholstery. Power bucket seats face a factory-fresh dash thats augmented with Vintage Air climate control. At the floor, a factory range selector leads a locking console. And the driver spins a reproduction Chevrolet Rally Wheel around a tilting column. If youre looking for a unique classic that mixes a great restoration with unmatched style and instant fun, call, click or visit https://www.RKMotors.com for more information on this buff Chevy!